Valley Electrical offer a wide range of electrical services for home owners, private landlords and property developers. From alarms and CCTV to testing and inspection, Valley Electrical can fulfil all your commercial electrical needs. Your satisfaction means everything to us and our reputation is built on customer recommendations. 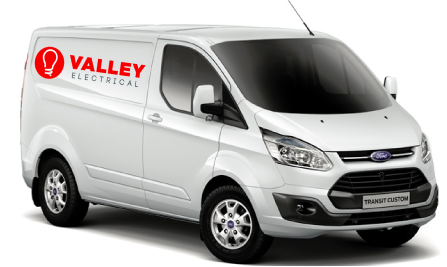 Valley Electrical is a local company based in Holmfirth offering a wide range of electrical services to domestic and commercial clients in Holmfirth, Huddersfield and the surrounding areas. We pride ourselves on having a strong team of expert electricians with the necessary skills, accreditations and experience to design and carry out all aspects of electrical installation. No job is “too big” or “too small”. From fitting a light in your home to a full re-wire or commercial contract work – all our work is carried out to the highest possible standards and is designed and installed to meet your exact needs and requirements. Your peace of mind and satisfaction is very important to us. All our services are fully guaranteed with an insurance backed warranty and are undertaken by fully qualified professionals in line with all relevant regulations. With 15 years’ experience in all aspects of electrical services, you can be sure that whatever the size of the electrical job, our highly skilled electricians will undertake it safely and professionally with as little disruption as possible to you, your home or your business. We value our customers and your satisfaction means everything to us. We are fully approved and accredited electricians providing you with the comfort you need that the work meets all necessary standards. We are a member of the NICEIC so all work carried out by Valley Electrical confirms to Part P of the building regulations where applicable. We are a member of the Government’s Trust Mark Scheme and all our work is undertaken to the IET wiring regulations (BS7671 17th Edition, incorporating Amendment 3). You can also find us on the electrical safety register. What can I expect from Valley? Experienced and fully accredited electricians. A personal and friendly service with customer satisfaction guaranteed. Locally based company you can trust.